Theme unit and stand alone lesson plans to accompany Maggie’s cartoon adventure, “Catch Up with John Smith”. The following activities are designed to give your students a greater understanding of the Chesapeake Bay and its environment. You will find activities to advance skills in reading, writing and comprehension, all with a social studies component. Children will read a graphic organizer containing notes about the Blue Crab. This activity is based on the Four Square Writing Method developed by Judith Gould and is sure to help students become better writers through organization. Students will learn about animals that live in the Chesapeake Bay region by putting letter tiles together. In addition to being a lot of fun this activity can give you a wealth of anecdotal information about how your student approaches spelling. Visit a very special place on the Eastern Shore of Maryland. Students will read five journal entries about St. Michaels. Good readers need to visualize what they are reading and this is the perfect activity to help work on this skill. It’s also a lot of fun! Read a conversation between Maggie and Lauren as they discover the art sailing and building log canoes. Students will need to use the dialogue to glean facts for the follow up activity. In addition, they will learn about the age old tradition of log canoes races in the Chesapeake Bay. From bridges to lighthouses your students will use math skills to problem solve and learn more about the Chesapeake Bay. Many two-step and higher-level math thinking problems are presented. The oldest lighthouse in the Chesapeake Bay was started in 1774. Can you guess why it wasn’t operational until 1792? Read about this lighthouse and three others standing in the Chesapeake Bay. Use computational math skills to solve word problems about these structures. Locals have mixed emotions about the Chesapeake Bay area bridges. While they carry them across the Bay towards the beaches they also cause terrible traffic jams in the summer. No matter what your feelings are you’ll learn more about these transport systems, when they were built and how much they cost! These activities stress the “how” of problem solving. The following activities are designed to give your students a greater understanding of the Chesapeake Bay and its environment. You will find higher-order questions and inquiry-based activities. Do you know what a paleoecologist is? In this activity you’ll not only learn what a paleoecologist is, you’ll learn what one does. Meet female paleoecologist Dr. Grace Brush who studies changes in the Chesapeake Bay. In this field guide format, students will learn about a disease that is hurting rockfish in the Chesapeake Bay. They are encouraged to use information to form their own hypotheses and to develop a plan to test one of these hypotheses. What might the Brita home water filter and the oyster have in common? Learn how oysters have been the filtering system for the Chesapeake Bay and why that system is not as effective as it was during the days of Captain John Smith. 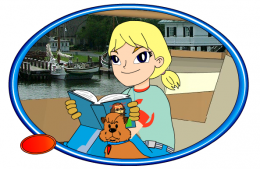 The following social studies activities are designed to give your students a greater understanding of the Chesapeake Bay Region, its environment, and the people who live there. You will find higher-order questions and attention to developing comprehension skills when reading social studies materials. Students will read an article about the economics of the Chesapeake Bay, particularly the life of watermen. From shipbuilding to fishing, the Chesapeake Bay is an economic force. Learn more about these activities and think how changes in the environment have affected them. Students read a short biography about John Smith and description of life in the 1600s. Learn more about the many problems he encountered as he helped settle Jamestown and charted the Chesapeake Bay Region. Greater comprehension is encouraged through the predictive activities that are included. Sit back, relax and watch the critically acclaimed, animated cartoon, ‘Catch Up With John Smith’. Captain Smith visits our very own Maggie in the 21st century. Learn why his is surprised to find the Chesapeake Bay in such trouble. The activity will help guide you through the animation! Do you like living on the water? Are you more comfortable with the sounds of the water than rap music? Maybe you would have been a good lighthouse keeper. Read this activity to learn more about this dated profession and test your comprehension with the literal and critical questions that follow.